I am one determine lady! For those who follow me here, you know about my roller coaster ride to get pregnant as a single woman. I spent a year doing IUIs, another year doing IVF and did my last IVF at the beginning of 2015. I was so happy! Happy beyond belief. It finally happened for me and I worked hard for it. I researched different supplements to take and I took them all. I started acupuncture on my last attempt, changed my diet a bit and upped my supplement intake. My pregnancy was a bit rough but I still cherished it all. I had morning sickness for 3-4 months. A month or so of feeling good, followed by the last 2-3 months of horrible hip pain. It got to the point where it hurt to sit at work, sit anywhere really, and even when I was laying down. But I knew it was temporary. I felt so blessed and scared. I realized I’m all this little boy will have. I need to make sure I will be around for as long as possible. My mom told me she was introduced to Plexus by my friend and her mom. She gave me some of the Plexus Slim “pink drink” to try and even though my pregnancy made me hate the taste, I gave it a shot. Much to my surprise, it gave me enough energy to help my pregnant self get through the day. And trust me, I needed all the help I could get. Don’t get me wrong, I was still tired but the drink gave me a natural energy that helped in so many ways. At night I had restless legs and realized while on Plexus, I didn’t have that anymore! Super wow, right?! So I’m almost at my due date and decided to jump all in and join Plexus. The amazing results I was having, I wanted to share with others and help others get healthy. Plexus products are all natural, which I absolutely love! I’m tired of reading how eggs are bad for you, milk is now bad for you, red dye #6 is bad for you, blah blah. I wanted something not processed and all natural. Anyway, joining Plexus was one of the best decisions I ever made. I love helping people and the results I have seen from my friends and family have shown how well these products work. 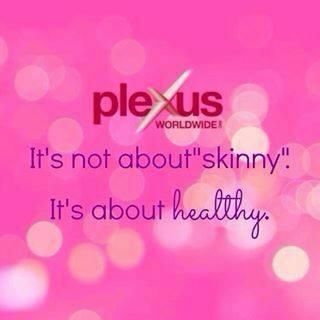 Plexus works on getting you healthy from the inside, and when that happens, it has the potential to fix so many other things.